If you haven’t been to an Ocean Beach Planning Board Meeting, this is the one you want to attend. I sat in one the Project Review Committee’s meeting on July 27th during which the group discussed San Diego’s ongoing refusal to abide by the wishes of the Ocean Beach community as outlined in the 1975 Precise Plan. Landry Watson gave the “public” (myself and two others) a brief overview of the history of the issue, which is well outlined in yesterday’s article by Frank Gormlie here. Once again I was struck by the sheer professionalism and endurance of our OBPB. The service they do appears to me to be not only difficult, time consuming and extremely boring but thankless and, in the end, emotionally draining. The Board reminds me of the statue of a Ferryman in Riga, Latvia–said to have persevered in carrying the baby Jesus across a raging river at night during a storm–that stands today as a visual guardian of the city. Like that guardian, our OB guardians wade through a river of details with only the Precise Plan to guide them. Their steadfast adherence to their own bylaws, their commitment to knowing the community plan that guides them, their willingness to carefully examine the details of that plan against the details of development proposals submitted to them is remarkable. But, what catapults this group into sainthood for me is their willingness to perform these duties in the face of a deluge of opposition from those who seek to get around the definitive wishes of the residents of OB (as outlined in the Precise Plan) with so little support from the people they’re serving. By “support” I mean a show of recognition of the importance the role these Board members perform. I am sure there are ways to do this other than attending meetings (I’m open to suggestions) but I think it behooves any Ocean Beach resident who purports to “love OB” to attend at least one meeting while they live here. Stop ignoring our hardworking and conscientious Ocean Beach community representatives immediately! Without any change, my guess is the city will continue to treat the OBPB as a joke. Despite the fact that our Board is no joke, we’re letting the city get away with this treatment and the city reaps the benefits. The City of San Diego profits from developers who must pay for special permits (variances) to get around our community plan. This extra income makes the mayor and everyone else look better in the eyes of voters. So the city treasury takes the developers money happily and politicians know there is still more benefits to come. Soon, they will be enjoying the increase in tax revenue because of the improvements they permitted. So far, Obecian’s apathy makes it clear we don’t care if the city ignores our own representatives, we don’t care if the city blatantly ignores the plan we Obecians came up with for OB and we’re okay if the city profits from Ocean Beach any way it wants. If we don’t stand up right now and defend what we love about this little bit of San Diego, it will be too late. Consider this; each time someone successfully builds something in Ocean Beach that should be built in La Jolla, they are destroying more affordable housing. It’s logical to assume that most often the type of people who move into these new ocean oasis residents do not value the qualities that make Ocean Beach special but would prefer to have a more sanitized, Disneyfied Ocean Beach. If enough people like this get a foothold here, the balance will tilt and they will have the majority to make decisions for the future of OB. In fact I fear it may already be too late as evidenced by things like the widespread and unfounded hate of homeless people and the ban on drinking alcohol on the beach. If this is okay with the majority of people in OB, if the scales haven’t tipped already, then there is nothing we can do anymore despite it being against what we all agreed to back in 1975. On the bright side, homeowners will make money (I am a homeowner) because the richer the people are who move here, the more money our land is worth. And, if you are one of the Obecians who have a fear of homeless people, your “problem” will be “fixed” (moved). Maybe for ambiance the OBMA will see fit to allow a homeless “eccentric” to be a sort of OB Mascot and hang out on the corner of Bacon and Newport. And all is not lost to those who remember how it was once, there will always be a few “hippy” stores selling tye-dye t-shirts, beads and incense (but no marijuana!). Sunshine Company will still be here (but its roof-top patio might close at 11 pm because of noise). Rich people can probably support an OB Museum honoring our eclectic rebel past, and environmental improvements like a nice boardwalk and a dog fence for Dog Beach might be possible, if you like that sort of thing. On the off chance that the scales haven’t tipped already or, even if they have and you just want to pay your respects, perhaps it’s time to go to an Ocean Beach Planning Board Meeting. 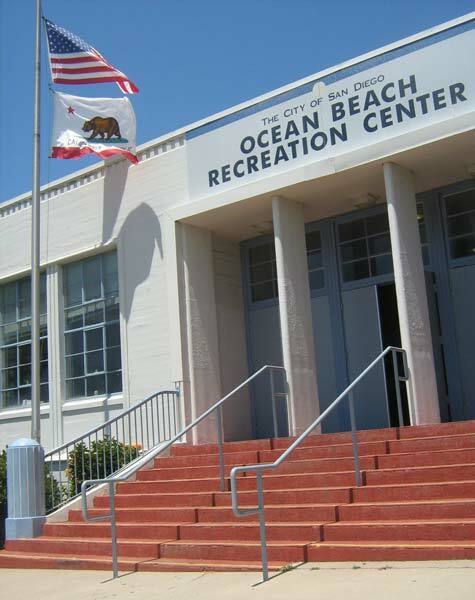 And, you’re in luck because, as I mentioned at the beginning, there’s a meeting tonight (Wednesday, August 1, 2012) and a very important one, at 6:00 p.mat the Ocean Beach Recreation Center, 4726 Santa Monica Ave., Ocean Beach.